2012 has been an awfully traumatic year for the South African fishing industry as it continues to suffer the fool that is Minister Tina Joemat-Pettersson. In its 2012 assessment of the Cabinet, the Official Opposition, the DA, had to note that had its assessment system made provision for grades lower than an ‘F’, Joemat-Pettersson would have qualified for the lowest. She in fact sets the bench-mark for gross incompetence. 2013 could potentially hold much hope. For one we TRUST that the Public Protector will find against Minister Joemat-Pettersson in the three outstanding complaints against her, including the R800 million Sekunjalo Tender debacle and her unlawful interference in the west coast rock lobster TAC matter. Based on the Public Protector’s first report on Joemat-Pettersson’s free and immoral use of tax payer’s funds on luxurious hotels and first class travel, she should have been removed from her post. But of course that is too much to expect since her profilgate spending is massively overshadowed by her boss’ own R250 million plus looting of the public purse for his Nkandla Compound alone. (Is it not tragic how we have come to completely rely on the Public Protector to protect us mere mortals from the ravenous looting of the public purse by these so-called elected officials holding the very highest public office?). 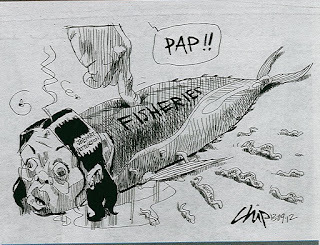 For the fishing industry, 2012 can best be summed up with the following collection of images and cartoons we have pulled from the archive. 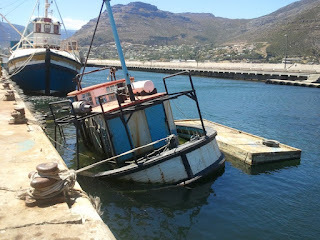 The shocking state of our fishing harbours is a consequence of the sinking state of the DAFF. Our harbours have become thoroughfares for illegal fish (especially lobsters and abalone) and drugs. 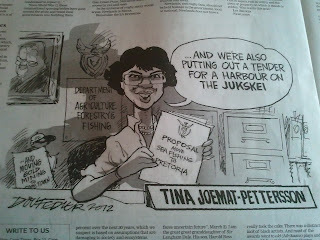 2012 certainly saw Tina Joemat-Pettersson demonstrate her uncanny ability to keep shoving her feet in her mouth. From demanding that fish be equitably spread across the country and away from the Western Cape; her relentless factually devoid attacks on the fishing industry; to her unwavering commitment to destroying the department of fisheries and what little capacity it had left. Tina Joemat-Pettersson’s child-like tantrum thrown at the Cape Town Press Club in May without doubt confirmed her immaturity and unsuitability for high public office. Aware that she would be unable to defend herself and her conduct in the presence of the DA’s Shadow Deputy Minister for Fisheries, she resorted to throwing a tantrum and demanded that the Shadow Deputy Minister leave before she would address the Press Club. 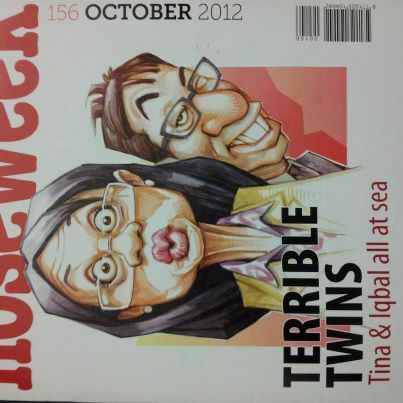 And so the title Tantrum Tina was rightly bestowed on this so-called Minister. Her staff would later also refer to her as Looney Tina and the department of fisheries (DAFF) as Daffy Duck. 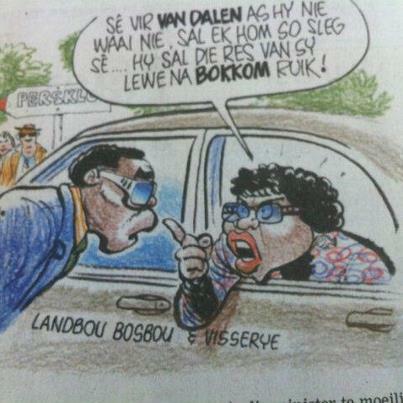 Jokes aside, this Minister has succeeded to bring fisheries to its knees in record time. 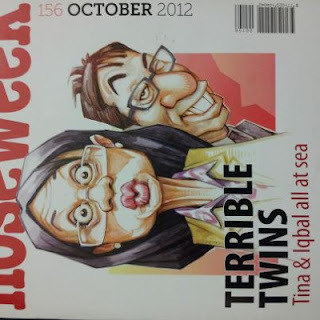 In its October 2012 edition, Noseweek captured the very essence of what has defined Tina Joemat-Pettersson’s reign of destruction of the South African fishing industry – the narrow-minded pursuit of self-interest. We keenly await the Public Protector’s report on the infamous R800 million Sekunjalo vessel management tender. 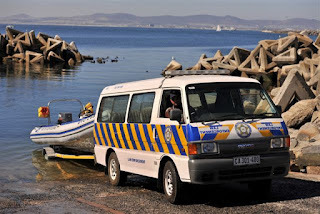 Frustrated with DAFF’s inability to properly resource its staff and reduce illegal fishing, the City of Cape officially launched its own marine fisheries enforcement unit in May 2012. In November, the DAFF confirmed to Parliament that it had conceded defeat to abalone poachers and recognised that abalone stocks would be poached to extinction in the fishing zones between Arniston and Kleinmond. 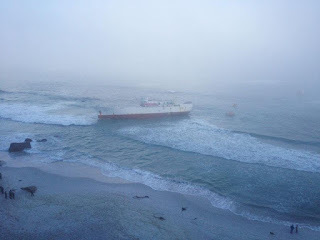 When the Japanese-owned Eihatsu Maru ran aground off Clifton in May, the incident again exposed the failure of DAFF and its Minister to properly manage our fishery resources and implement South African fishing laws. 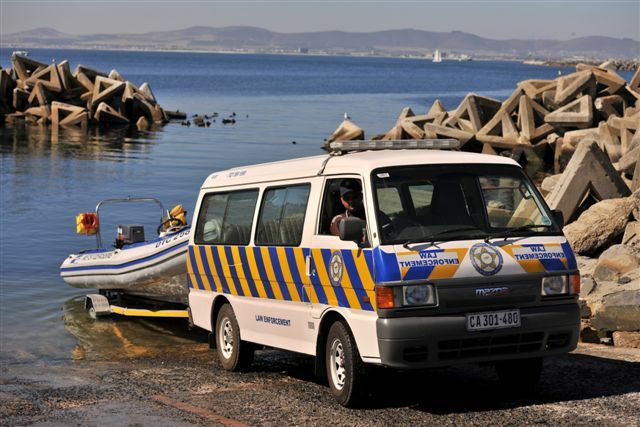 The grounding of the vessel confirmed that DAFF was issuing foreign fishing vessel licenses in complete violation of section 39 of the Marine Living Resources Act. The incident also confirmed that had DAFF adhered to these provisions, the owners of the grounded vessel would have been forced to immediately pay for all salvaging and environmental costs associated with the grounding. Landing Snoek on Paternoster beach on May. There were tons of illegal lobster landings as well. Not a single Fishery Control Officer or monitor in sight. All fish landed was undocumented. Most expensive lobster on offer was R30! Snoek was sold at R40 each. The scourge of illegal lobster fishing predominantly by the “interim relief” sector has plunged lobster stocks to crisis levels. Lobster is 97% overfished or is at 3% of pristine biological levels. Biologically, lobster is worse off than abalone and most line fish species which are considered to be in environmental crisis. 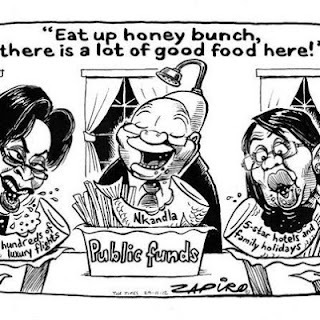 In its annual assessment of the Cabinet, the Democratic Alliance – South Africa’s official opposition party – has rated Minister Tina Joemat-Pettersson an unsurprising “F”. We have noted that an “F” will not be considered too disastrous in ANC circles as an F is considered a pass of course these days. Hell, you need to get less than 30% to fail a South African test today! So an “F” certainly does not justify the official opposition’s call that this useless Minister who spends tax payers money …. well like her boss, the President …. faster than us sods can submit tax returns! Read the full Cabinet Report here. It makes for tragic reading. Does DAFF have a DDG? Has the Minister of Fisheries finally got around to appointing a (non-acting) Deputy Director-General of Fisheries? Feike has heard that Ms Greta Apelgren-Narkedien was appointed as the new Deputy Director-General of Fisheries with effect from yesterday (3 December 2012). Ms Apelgren-Narkedien is currently still listed as the Head of Department of the Northern Cape’s Department of Cooperative Governance, Human Settlement and Traditional Affairs. Although Ms Apelgren-Narkedien’s professional qualifications are unknown, what we do know is that she served in the ANC’s armed wing, Umkhonto weSizwe (MK). Ms Apelgren-Narkedien was one of the MK Soldiers involved in the infamous of bombing of Durban’s Magoo’s Bar in 1986 which resulted in the death of women and more than 70 civilian injuries. Ms Apelgren-Narkedien applied for amnesty to the Truth and Reconciliation Commission, together with Robert McBride in 1999. Amnesty was granted in April 2001. 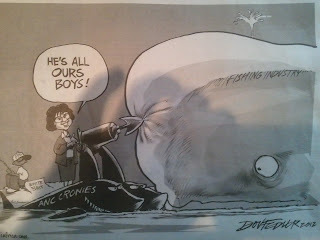 Although Ms Apelgren-Narkedien’s permanent appointment (if confirmed by DAFF) will end the farce of having had some 9 acting DDG’s over the past 2 years, it remains to be seen whether Ms Apelgren-Narkedien’s lack of fisheries experience and knowledge will simply fast-track the total implosion of DAFF. Like most institutions in this country, the fisheries branch has become nothing more than a political turf. Most recently we have seen the Minister’s slimy hand involved in the unilateral and sudden abandonment of the west coast rock lobster recovery plan and operational management procedure to satisfy a single right holder who happens to have a direct phone line to her. 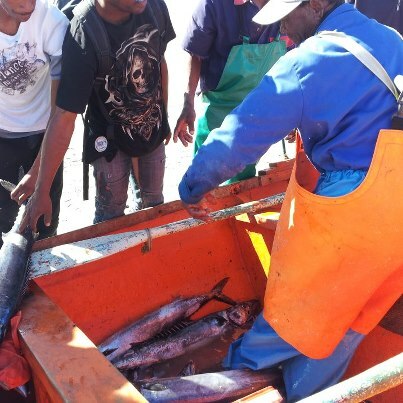 fisheries compliance remains moribund at best despite valiant efforts by a number of extremely hard-working fishery control officers on the ground. The department recently confirmed to Parliament that it has effectively given up the battle against abalone poaching with their strategy firmly focussed on confiscating as much abalone as possible (and thus earning more and more money from illegally harvested product). inshore fisheries management has fundamentally failed. Every single inshore fishery has been decimated by IUU fishing. The oldest fishery in the land – traditional line fishing – remains under environmental emergency; abalone has essentially completely collapsed between Arniston and Hangklip (Zones A – D) with zero recruitment being recorded in Zones C and D; and lobster is at 3% of pristine or 97% overexploited and the Minister has just abandoned the recovery plan to appease a single right holder. the general but escalating mismanagement of fisheries increasingly places South Africa’s prized hake trawl MSC certification at risk. It is therefore hard to imagine how Ms Apelgren-Narkedien will compensate for her lack of expert and high-level knowledge of fisheries management as she seeks to address the above major obstacles in the next 6-12 months. Hint: Perhaps Ms Apelgren-Narkedien should urgently look back in history to 2000?